​If you've ever wanted to work in steel, here's your chance! 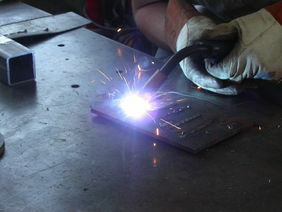 Students will learn the basics of mig welding and how to use the necessary tools that are required to work with steel including: chop saw, angle grinder, mig welder, and basic jig tools. 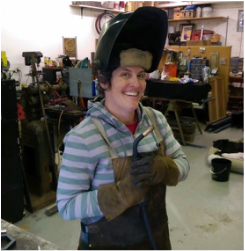 Kathy says she's been addicted to metal since discovering metalsmithing and jewelry design at Indiana University. Now, many years later, she works on larger scaled pieces in steel, stainless steel, copper and zinc. Kathy produces architectural metal work including railings, gates, fireplace fronts, stove hoods, and backsplashes in her studio, Brazin' Hussies, located in Boulder. She also designs sculptures, tables, furniture and just about anything her clients can dream of. Specializing in copper and zinc from countertops to one-of-a kind artwork. Six students maximum. Students will be required to sign a waiver. Participants must be 18 or older.